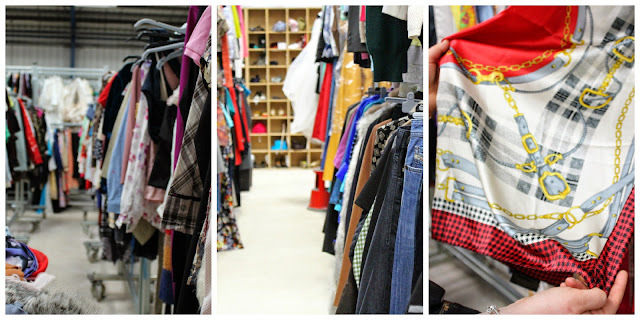 Last week I got to have a peek into the world of sustainable fashion at the Oxfam warehouse in Batley. I'd never really thought about how Oxfam organise and utilise all of the donations that the lovely general public donate- I was quite amazed if I'm honest! Oxfam’s Wastesaver depot in Batley receives in excess of 19 thousand items of clothing PER day… to cope with the sheer volume of items in the most efficient way possible their Batley base consists of a whole lot of conveyor belts, a handful of highly skilled garment sorters (who sort the items into 25 different categories..yes 25!) an online team and lots of cups of tea! The Batley Wastesaver depot receives all the stock that hasn't sold in the Oxfam branches in towns and cities all over Northern and Central England. When we arrived the warehouse we were given an itinerary of how our afternoon would look and I got just a tad excited- a tour around the warehouse, an Oxfam fashion show, a chance to look at their online store department and of course cupcakes and tea! We were firstly led to their meet and greet area to all pop down our bags and get our cameras at the ready..
Before heading into the warehouse we had to don some pretty fetching high vis jackets- safety first n all. Once in the main warehouse we were greeted by a friendly team of sorters who’s job it is to sort through tons of items per week. Each sorter has the huge task of sorting items into different bins depending on various criteria such as- shirts,jeans,children's clothes etc- I wish I’d taken more notes.. but alas I was too amazed by it all! Oxfam was actually one of the first major charities to launch this type of sorting depot- their aim is to basically maximise the money they make from clothing donations and minimise the amount of garments they send to landfill. So, they’ve got huge cages full of donated items and the sorters get to rummage through it all to find items that are suitable to separate out into categories. They also leave some items on the conveyor belt- these items then get baled up to sell to ethical clothing traders across the world. Oxfam ensure that any of the traders they sell to fit strict specifications which is great to know. The fact that nothing gets wasted amazed me- even if a pair of old jeans are too ripped to wear Oxfam sell these to companies who need scrap material to make things such as matress fillings! All the money is then put back into Oxfam’s projects. A lot of the items in the warehouse aren't sent overseas to areas of crisis that need immediate aid- it would be a logistical nightmare to ship tons of clothes all over the place so they are sold to various different organisations and then the money they make is then used to provide aid to places such as Nepal after the recent earthquake. In these containers Oxfam store the huge amounts of shoes and bags that donated- approx 9-12 tons per week to be precise! If any of the clothes that come out of the donation bags in the sorting room are seen to be suitable to go on the Oxfam website these are then packed off into the into the room next door to be catalogued and put onto their website to sell to fashion lovers! 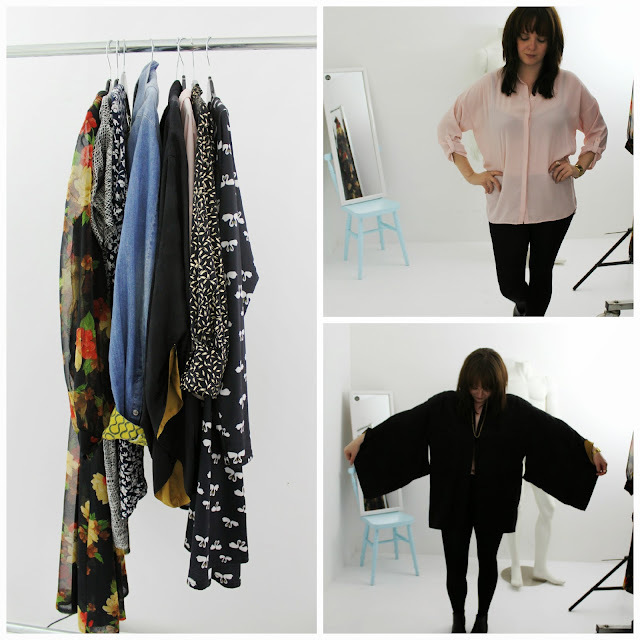 The online shop team see their customers as- the classy lady who wants quality clothing at cheaper than retail prices, younger ladies who want to add vintage pieces to their wardrobe and high end vintage shoppers (both men and women) who want to pick up designer bargains. This was the bit I was looking forward to...getting to rummage through the huge amounts of items that the sorting team had put aside to be sold online. I love this sequinned top that I found in one of the clothing bins- kindly modelled by Lorna of course! My fave section was the scarfs- so many vintage lovelies! Then we had a peek at some of the shoes they have listed too! Look at that pair of Loboutins! Once we'd spent some time looking through all the items and taking photos we were then invited to view a fashion show they put on for us- there were some amazing outfits in the show and it got me thinking about how I versatile the items from Oxfam are! 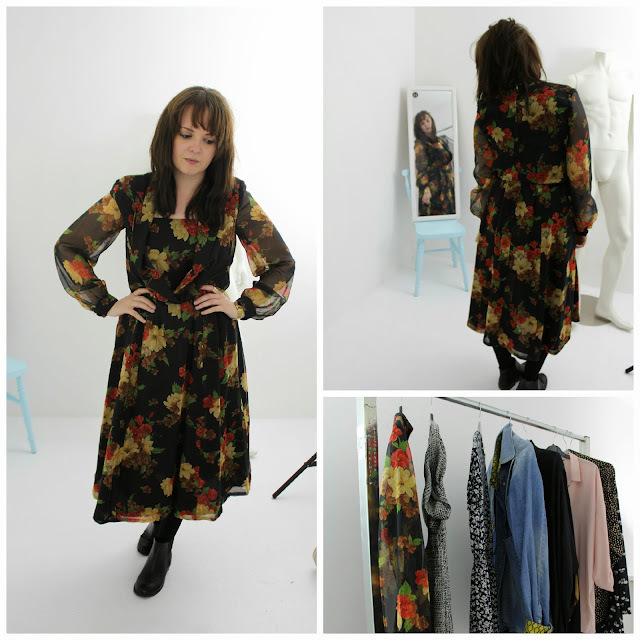 It also got me thinking about how rather than looking in vintage shops for pieces I should firstly go to their online shop! Once the fashion show was over we then got to have a look at some selected pieces that were available to buy on the day- their changing room was actually the room they use when taking photos of outfits for the website so the lighting was really good and me and Lorna had a bit of fun posing in the bits we tried on! I loved this flowery dress- from what I could tell it was handmade! I ended up buying two items- the pink shirt in the picture above and a sparkly number that I'm going to do an OOTD in another post later on this month. We were then treated to a cuppa and cupcake before being given our goody bag and a free pair of sunnies! 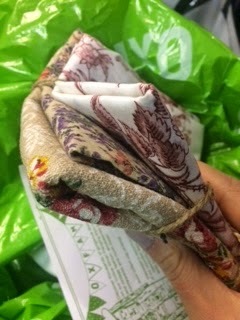 In the goody bag were some really lovely samples of some vintage fabrics- not sure what I am going to do with them....any ideas? I had such a lovely day at the event and it really reminded me that although its all good and well trying to sell your old clothes on Ebay and Depop but sometimes its great to donate to charities- what shocked me was the fact that they hardly bin anything- everything goes to good use! This has actually given me an idea.. I work in a huge office and I'm now organising a clothing collection day to then donate the pieces to Oxfam. I popped into the Oxfam near me last week and have arranged for them to provide me with some collection bags and leaflets. They also told me that when any items are donated Oxfam can claim GiftAid! Do you donate clothes to Oxfam? Whats your fave piece you've bought from a charity shop? Very interesting and informative to see behind the scenes, thank you Holly.